viewfromaloft - DotDotDash: Hecho en L.A.
City of LA "Made in Mexico" from VFaL photo archives. In 2006, LA City Nerd found one just like this, and made a call to action for bloggers to survey manhole covers. 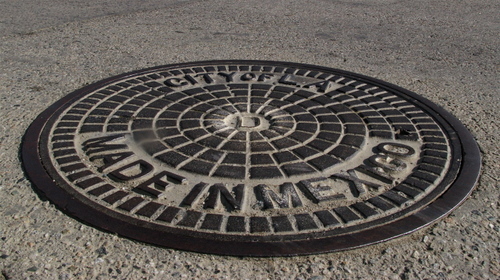 STEELING IDENTITY: It appears again and Daniel Hernandez nails it when he writes "It's not often you get a cultural lesson from a piece of municipal property, but this actual manhole cover plainly conveys the essence of Los Angeles, day after day, politics and media games aside." The essay from the ese is in the March issue of Tu Ciudad . . –– It Goes On: "The message, etched in steel, is not a call by Chicano nationalists for a reconquest of the American Southwest. It is simply a statement of fact." You can find it on page 17 for those keeping score at home. IT HAD TO HAPPEN: "I have been thinking about this blog for a long time while growing up Salvadorian in East Los Angeles" writes Wendy Carillo at the new Stuff Chicanos Like . . –– She's sticking it to the "white" man . . as she notes how that other one beat her to the punch. . . –– Carillo's first post contains the advice that 'it is Art Laboe that allows Chicano Cholos to express their tender side through the dedications in a world that often times oppress our Brown Community." WHAT ELSE CAN BROWN DO FOR YOU? : Want to know how to build a Lowrider? Los Angeles EastSide Scene has details on the April 19 seminar being held at the Peterson. POST CHICANO-ISM MOVEMENT: If you don't have a major show since the 80s, does the movement exist? Maybe not, according to Chicano art, beyond rebellion . . –– Agustin Gurza writes about LACMA's "Phantom Sightings: Art After the Chicano Movement' as an exhibit "stirring debate, starting with the subtitle, which draws its own line of partition: 'Art After the Chicano Movement.' ". . –– He goes on: "It suggests not only a generational but an aesthetic break with Chicano artists who emerged during the civil rights struggle, known for illustrative paintings and murals, political content and traditional iconography, such as revolutionaries, lowriders and the Virgin of Guadalupe." I thought that Chicano art was crossing borders when I saw XHICANO@DEMIURGE and wrote: "There were rumblings from the “old school” who said it wasn’t Chicano art at all, due to the lack of any political content, no narrative of the legacy of the art movement’s beginnings or the struggles of generations past. . . –– LACMA's opening was still a party, as seen by Pachucoville: "It was a night full of the of La Chicanidada universe. At every turn there were old friends introducing me to people I have read or heard about. It was Chicano/a heaven." Last add for the movement: At LACMA this morning, Curator Reina A. Prado is leading a discussion on the next generation of Chicano/a artists in Rethinking Identity. . . –– Included in the discussion is Sandy Rodriguez and her work "Burn Hollywood Burn" . . –– Getting the word out: Rodriguez sent an email to credit VFaL for helping her secure a Phantom Gallery downtown storefront space for later this year. No, Sandy, it's all you rolling with the tough crowd; The Getty. I don't think we need to 'Re-Conquer' the traditional lands of the Mexican people, since we have always been here in the West/SouthWest. And on a simular note: If displaced people's have the "right of return" to their native lands,(As in Isreal, etc.) then the Mexican people have a right of return to the SouthWest @ will. These are our native lands. Just a logical thought.